Few games capture the thrill of the hunt like Monster Hunter. Hours of work, preparation and practicing on lesser mobs, culminating in a final standoff. A creature looming just ahead, multiple times your size, who eats hunters for three meals a day, waiting for you to take the first swing. A long dance, trading blows, both parties trying to keep their cool while their swings become more desperate, health both rapidly approaching a deadline. And when you return triumphant, with pelts, claws and other trophies in tow, you have the true pride of a hunter. The larger monsters are pretty impressive to see. For newcomers to the series, there’s never been a more welcoming entry. Systems are explained in much greater detail, and the many different kinds of Quests and Expeditions you can embark on are gradually introduced over the course of the game’s opening hours. The game opens with a bang: you’re a new hunter on your way to Val Habar, to make a name for yourself. You’re guided along by your caravan’s leader, learning the ropes through quests, and soon you’re part of the Caravan, in search of the source behind a mysterious treasure. To be honest, the story is there to bring in more locations and bigger monsters, but it does its job. The characters you meet along the way are enjoyable, if a little forgettable, but the cutscenes do a great job of setting a sense of scale and wonder in the world. The large, spacious areas allow for a greater variety in terrain than seen in previous games. 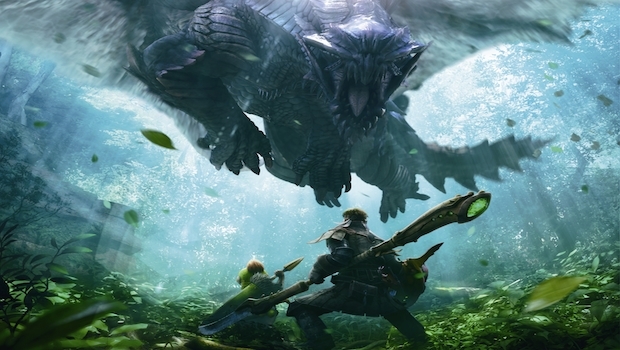 Visually, the game looks a notch above Monster Hunter 3U’s handheld entry, but not by much. You’ll still see some low-res textures and jagged outlines, but when you’re in the thick of things, there isn’t much time to spend staring at the aliasing of an attacking monster. While it isn’t the prettiest, it manages, and there were few times I had trouble distinguishing monsters or their attack patterns. Where Monster Hunter 4 really stepped up on the technical side is the areas themselves. Arenas are much grander and often utilize verticality, allowing you to use height to your advantage and combat enemies while on cliffsides. It’s a little annoying that executing the crucial “rodeo” mechanic of jumping on a monster’s back seems like threading a needle, the added height really breathes some fresh air into the combat, and lets both close, medium and long-ranged weapons shine in any situation. As the hunts get bigger, the weapons and armor you use become more ornamented and impressive. You can try out the giant arsenal different weapons right from the beginning and get a sense for how they work, though it’ll be easy to quickly determine which set best suits your playstyle. I found myself constantly going back to the speed and damage of the Dual Blades, but all the weapons look great and are easy to learn. The Insect Glaive, a new weapon combining a dual-hand staff with an insect buddy, allows you to sap enemies for power mid-combat, a really effective tactic if you’re having trouble against large bosses. Mounting is a crucial mechanic to toppling monsters, but it can be a frustrating to pull off consistently. Controls are as tight as they’ve ever been, and even without a Circle Pad Pro, the camera never feels like it’s actively holding you back. I’ll note here that I reviewed the game on a 3DS XL, so the New 3DS might also help alleviate camera control issues even more with its extra thumb stick. The touchpad controls are also extremely helpful, as many different important functions like your First Aid and map controls can all be mapped to your bottom screen and re-arranged, creating a nice way for players to personalize their control scheme. There’s also no underwater battles, so those who remember them from MH3U will thankfully never have to deal with that waking nightmare again. While the handling is quick to learn, the difficulty comes in the mastery of Monster Hunter’s brutal combat. While Jaggis and other early monsters are forgiving, even the early bosses start to test your abilities and punish you for burning all your stamina in a single assault. The Kecha Wacha, a hilariously-named primate with a trunk for a nose, serves as your final gatekeeper out of the game’s “tutorial” area, and it’s a fight that took me several tries to finally conquer. Get ready to fight a lot of these guys, in growing numbers. It’s moments like this that made Monster Hunter 4 stand out so much to me, yet it’s a game where the minutia ultimately holds back the highs. Finally conquering the Kecha Wacha was exhilarating, but the grind of quests leading there was drawn-out and repetitive. There’s still plenty of fetch quests, and early on you’ll be tasked with bringing back an egg that drops and breaks if your character is attacked by the thousands of Jaggi between him and the drop-off point. There’s many points where the objective is unclear, and you have to either guess at how to beat certain subquests or, like me, stumble into them completely by accident. It can get frustrating when you want to spend time killing big monsters, but instead you’re trying to catch five Sushifish and you keep pulling up Glutton Tunas. Monster Hunter is also all about progression through gear; killing monsters gives you crafting components, components give you better armor and weapons, better armor and weapons lets you kill bigger monsters, repeat ad nauseum. At times the grind truly starts to wear on you, after you’ve killed your hundredth Jaggi or you’re grinding areas looking for that one high-level component. This is all layered in many different systems and mechanics that the player has to learn to manage. While early on it won’t matter much, later you’ll be hunting for crafting items, putting in item growth requests, sending StreetPass hunters on jobs, picking which meal will give you the best benefits for each hunt… it’s a lot to take in, and for newcomers, learning Monster Hunter’s many systems and mechanics is an extra layer of difficulty on top of the already-punishing combat. You’re going to need some friends to take on the more challenging hunts. The draw for Monster Hunter is in the “raiding” and taking down giant monsters, though, and that’s what the grind gives you a sense of scale for. Prepping up for a big fight, gearing up with all the armor and weapons that are adorned with trophies of previous conquests, and finally engaging in combat is the rush that Monster Hunter fans tend to crave, and 4 delivers in spades. The multiplayer offers even bigger monsters as well, for groups of friends to band together and take down for even more epic battles. You can team up with players, or with AI-controlled cat warriors, if you’re into cat-based puns. Monster Hunter 4 is massive. In my time with it, I felt I was only scratching the surface, not even coming close to the highest level of quests or bosses. I was beat down repeatedly by bosses, forced to grind and upgrade my gear to keep up, and take paper notes to keep track of what items I was searching for and to keep a pre-hunt checklist of utilities and weapons. My hand cramped repeatedly from too much time spent clutching the 3DS, and there were many moments where I cursed the developers, for every missed rodeo attempt and death at the hand of a raging boss monster. Yet I kept coming back, putting it down to only pick it back up. There were clear, discernible things I didn’t enjoy, from the annoying fetch quests to the minigames and slamming a pickax against crystal, hoping for a decently rare mineral instead of another whetstone. And still the thrill of another epic fight, another kill of a monster I thought insurmountable awaited me, pulling me in. Maybe that’s what keeps diehard Monster Hunter fans going. For me, it’s at least got me intrigued. Monster Hunter 4 has a lot of repetition and grinding, but succeeds at capturing the thrill of the big game hunt like no other game can. If you’re looking for a long-term game with plenty of loot to grind, quests to beat and bosses to kill, this is your game.